In preparation for it’s next art show, The Hive Gallery published a full-page ad in the December issue of Juxtapoz magazine. The ad showcases Cody, along with a selection of The Hive Gallery’s other resident artists, including a prominent feature of Yoko D’holbachie. Cody is currently producing a new painting for the tarot-card themed art show that will kick off at the Los Angeles-based Hive Gallery on January 8th. Cody’s card is the “Page of Wands“. The next installment of Cody’s developing group of “Budgie-Sattva” paintings is near to completion as well. Look for brand new work in the coming weeks! 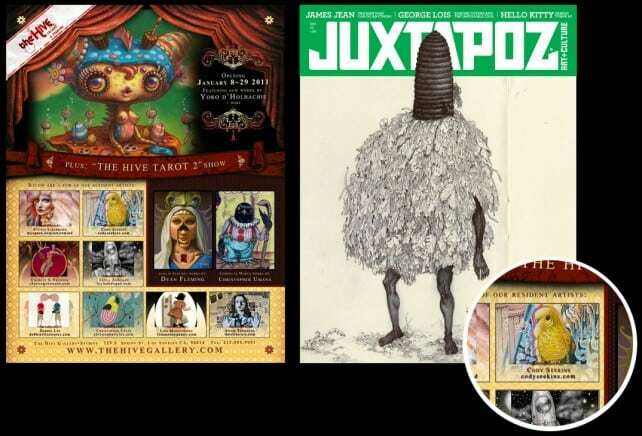 As of this writing, Juxtapoz Magazine is the most widely-circulated art magazine in the United States. The ad featuring Cody was published on page 143 of the December 2010 issue of Juxtapoz Magazine.